ajestic oak trees and lush bamboo umbrella the path to the Fairfax House, an elegant sugar cane plantation home. Manicured gardens and porches swept with morning dew evoke romantic images of times past, when graciousness was an art form. Picturesque rooms have the indulgent elegance of pre- Civil War Acadiana with all modern amenities. Southern hospitality and beautiful surroundings make the Fairfax House the perfect place to unwind or simply explore the rich culture of the City of Franklin. Savor a hearty Creole breakfast and take a bike ride to nearby Argus Spa. Quiet streets lined with turn of the century style iron light posts and historic plantation homes preserve the timeless beauty of Acadiana. Situated near the historic Bayou Teche, the Fairfax House has many beautifully appointed spaces to host your wedding, party, or special event. Your hosts’ fine attention to detail coupled with an unwavering commitment to guest satisfaction will ensure any visit to the Fairfax House will be a thrillingly memorable one. 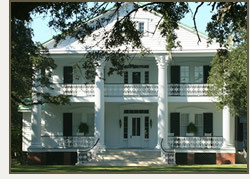 The Fairfax House, formerly know as Shady Retreat, was built in 1852 by John Barrett Murphy, . He built the house for his daughter Martha who was married to Thomas J. Foster. The house was situated with a view of the Bayou Teche, the Main St. of Franklin, in the midst of a working sugar cane plantation. 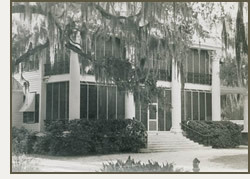 The house was expanded in the 1920's by W. Prescott Foster. His beloved daughter Fairfax was the last family member to live there. The Fairfax House has been fully renovated by its new owners and updated with all of the modern amenities.